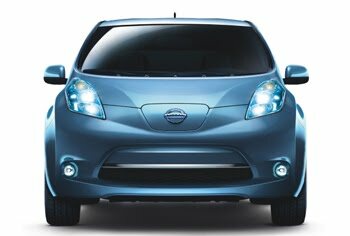 Uftring Auto Blog: Electric Vehicles Chevy Volt and Nissan LEAF Coming to Peoria! Electric Vehicles Chevy Volt and Nissan LEAF Coming to Peoria! The automobile industry is taking us into an exciting new era with some of its upcoming vehicles. The Nissan LEAF and Chevrolet Volt are two different approaches to implementing electric powered engines into cars. These are two hot vehicles that are generating a lot of buzz, and we at Uftring are proud that we will be able to offer our customers a choice of electric vehicles at the end of this year through our Uftring Nissan and Chevrolet dealerships in Peoria. There are many benefits to electric powered cars, including zero emissions, a much lower cost of travel than using gasoline, and reduction of dependency on foreign oil among others. Both the Nissan LEAF and the Chevy Volt can be powered up by plugging them in to an outlet at your home. The Nissan LEAF runs purely on electrical power. It doesn't even have exhaust pipes because there are no emissions! Customers can actually pre-order the Nissan LEAF through the LEAF's website for $99, though that doesn't guarantee you a vehicle. The Nissan LEAF can travel up to 100 miles on a charge - perfect for traveling around Peoria, Pekin, Chillicothe, Bloomington Normal, or Galesburg. This car is exciting because it's real, not just a concept, and they will be in our Peoria dealerships this fall and winter! Uftring Nissan, in Peoria on Allen Road, will see the Nissan LEAF arrive in stock sometime this December. That means you could be driving an electric vehicle in Illinois before the end of the year. The Chevrolet Volt is another take on the electric car, though it isn't purely electric like the Nissan LEAF. The Chevy Volt does not have a gas engine, but it does have a gas generator that will power up to produce more electricity for the battery when its charge is depleted. 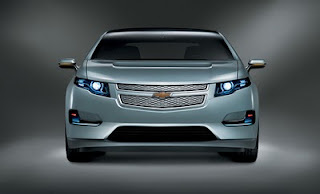 The Chevrolet Volt can travel up to 40 miles on an electric charge, and about 300 miles overall with the gas generator. The Chevy Volt should be in Peoria sometime in November. You can read in more detail about these electric cars in Peoria at the Chevrolet Volt page on JimMcComb.com and the Nissan LEAF info page on the Uftring Nissan website. We're extremely excited for their potential and that we can offer our customers a variety of vehicles to suit their tastes, preferences, and lifestyles. Visit us online if you need any Nissan service or Nissan parts to your vehicle in Peoria, or if you need any Chevy parts or Chevy service for your vehicle in the Peoria area. We hope to see you soon! Visit for updates on the latest vehicles and happenings at the Uftring Auto Group, and don't forget to become fans of the Jim McComb Facebook page and the Uftring Nissan Facebook page to stay on top of the most recent news.